SpaceX Just Launched a Device That Will "Change How We Interact with Space"
The company says this represents "the first industrial use of space." On December 15, 2017, SpaceX launched the CRS-13, a resupply service mission contracted by NASA. Originally scheduled for three months ago, the launch has been delayed seven times. Finally off the ground, the Falcon 9 rocket is carrying a Dragon space capsule with more than 2,000 kg (4,800 lb) of cargo to the International Space Station. A piece of that cargo is a device about the size of a microwave created by Made In Space, Inc. (MIS): a manufacturing unit that uses microgravity to produce more efficient optical fibers. Optical fibers support much of the world’s internet and television systems — a demanding task. MIS believes fibers manufactured in space would be able to handle more data traffic and send signals over long distances with less delay compared to their Earth-made counterparts. 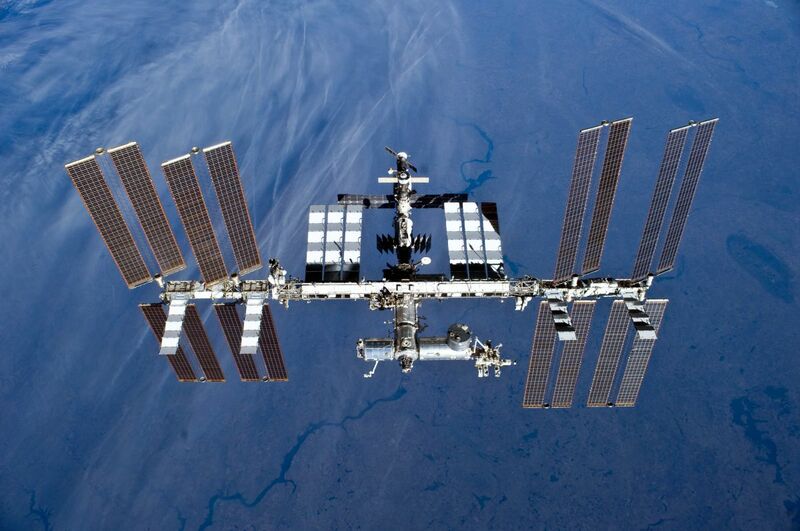 The International Space Station could be home to a new manufacturing industry. Credit: NASA. Once the device is plugged into the space station, MIS will command it to begin manufacturing nearly a kilometer’s worth of the new optical fiber, called ZBLAN. When the task is complete, astronauts can unplug the device and stow it in the capsule, which is slated to return to Earth in January. The company’s press release stated that manufacturing the fibers in microgravity will provide significant improvements over versions produced on Earth. According to Rush, after the space-made materials return to Earth and are tested by MIS, they plan to begin selling it. To send data over short distances, telecommunications companies use cables that carry electrical signals. But for longer distances, it’s cheaper to use pulses of laser light shot down silica glass fiber optic cables. The world is crisscrossed with webs of these cables that are only a few tens of microns across — about the thickness of a human hair. They run under every ocean and between every continent. These silica cables are expensive. Not because they are costly to make, but because they are imperfect; even the best-made glass is not one hundred percent transparent. Whenever these cables are made under the presence of gravity, some crystals form in the glass. Due to this formation of crystals, light passing through gets weaker over longer distances, which means the signal has to be boosted many times along its path. These boosters, called repeaters, are expensive to set up. They also add a delay to each transmission. While the delay is only measured in milliseconds, to computers doing financial transactions or streaming data that feels like an eternity. Experiments in zero-g aircraft have shown that if these fibers are manufactured without gravity, there’s nearly 10 times less crystal formation. Less crystal formation means the fiber can transmit information over a longer distance — research that MIS leveraged to create a device capable of making the superior fibers in space. When talking about ZBLAN, Rush said, “You could lay a line across the Atlantic Ocean that has no repeaters in it.” Typically, repeaters come every 50 or 100 kilometers — so here, fewer repeaters mean less signal delay. He also said that the fiber would dramatically increase bandwidth, sending 50 to 100 times more data down a single strand than silica fibers. If Made In Space, Inc. can deliver, it could also help telecommunication companies get more bang for their buck. “On a dollar per kilobyte basis — which is where the rubber meets the road — we can be at a same or better price than silica once we produce ZBLAN en masse,” Rush said. Now, Owens said the rocket industry has advanced rapidly, with launch reliability going up and costs going down. NASA frequently allows other companies to join their launches, which prevents a company like Made In Space, Inc. from having to front the entire $62 million cost of this Falcon 9 rocket launch, for example.